The basic wish to ride your bike better. That’s what it was all about. I would imagine that any motorcycle rider could relate to me at some level. Back in my mid 20’s that was the reason I started to attend HMS (Honda Motorcycle School) and continuing into practicing the sport of Moto Gymkhana. You got to start somewhere and you need a lot of practice to get skilled. If it were not for the damage, the rider would simply just be able to pick up the bike and continue on practice. Getting in longer practice sessions and ability to give more effort into their techniques. Almost every time people fell, their machines were getting damaged. Either levers and handle bars were bending or braking off, plastic cowls were cracking up and generator covers cracking and even spilling out oil at times. Falls were basically time consuming and difficult to recover from and not to mention very costly. I started to feel that something must be done. So when I got my CBR600F2 back in 1992, I decided to make bumpers for it. Something that can protect my bike from damage. I made the discovery that there was an unexpected blind spot with the conventional guards. The points were that the guards until then were always mounted on a low area of the bike and shaped to protect in such a way that made the bikes pivot and flop over itself. This made it very difficult to protect certain areas such as the gas tank, the dashboard and the handle bars and levers. Also it got in the way when laying the bike down in corners and resulted in a lower bank angle. And to top it off traditional bumpers were always very large and bulky and most of all, very heavy. They were not doing the job right, very heavy and got in the way of riding. With all of these problems in mind, my new sports bumper was created. Through trial and error I was able to make a bumper that guarded the gas tank, handle and levers and the dashboard unlike the traditional variations did. Although the design included engine side covers like the dynamo cover and clutch housing to be an active contact point, no major damage to these areas happened anymore. And I was able to avoid cracking and breakage that leaded to oil leaks. For the first time ever I felt that I was able to focus more on my riding skills. I didn’t have to worry about falling and damaging my bike as I did before. 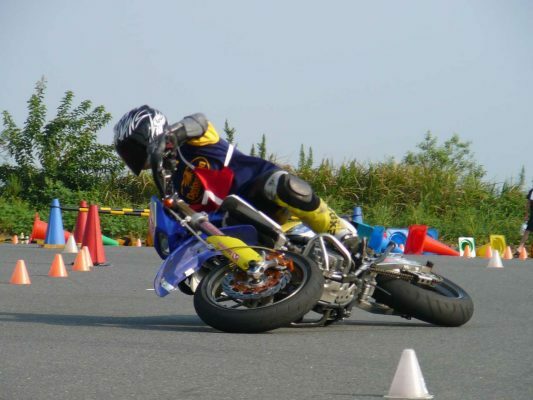 Practice got easier and finally in 1995 I became the annual champion for The Japan MotoGymkhana Dunlop/Autobike Cup. By this point word had spread and I started making similar sport bumpers for other people. First for friends and fellow team members, and then other athletes of Moto Gymkhana. The first models we began to manufacture were for vehicles such as the Honda CBR600F4i, the Honda Hornet 600 and the Kawasaki ZX10R. 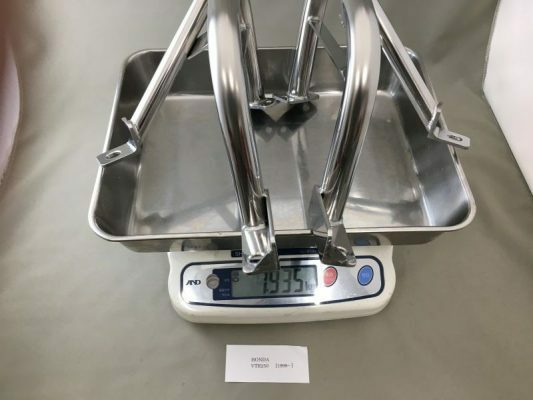 During this process I found that depending on the type of bike you will need a different design of guard to achieve maximum protection. After accumulating a wide range of data I found that people from all over Japan were getting interested and started to contact me via email from many other parts of the country. I was able to expand a wider variation of guards through producing new types for these people. From there I decided to extend the idea into a business and open my current company Sakuta Sports Bumper or SSB for short. And labelled this as the brand name. 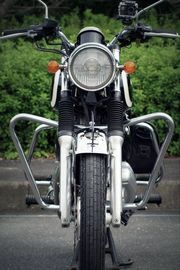 Here is an example using a Honda CB1300. This was an excellent design which was also implemented on the Honda CB400SF. 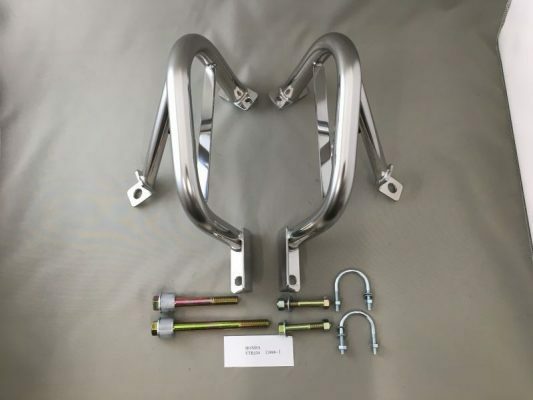 I aimed to make the SSB to be extremely lightweight and compact bumper that can be used in sport motorcycle riding without sacrificing the bank angle during corners. Its design has been found that it can also be applied in normal town riding, and not just it’s initial purpose of competition. It protects the vehicles elements to the utmost without sacrificing the performance of the vehicle. However, there are always various situations of fall, so it can not guarantee to protect everything 100%. And although we prioritize compactness and large bank angle, some places that protrude outward in low areas might touch the road surface while in corners. Those wishing to perfect protection of the bike and don’t need a large bank angle, we recommend a larger bumper like a driving school. In addition since our SSB are all made of all stainless steel, it will not start rusting, even if you get it scratched up. To have the ability to protect the dashboard and gas tank as much as possible. To not disturb the motorcyclists performance to riding fast. To have a clean outline, so it’s not too intrusive against the original vehicle design. These are the 3 basic concepts we aim for for all of our projects. Also it is our dream to one day to be able to make SSB for all the types of bikes in the world. Click the link to the form below to ask us if you don’t see your bike on our list. and we do a variety of many other things, so just feel free to ask us if you wonder about anything. Contact us from this page!